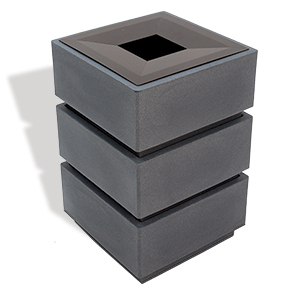 Trash receptacles don't have to be spiritless, add visual excitement to indoor and outdoor facilities with a three tiered receptacle. The trendy, modern, geometric design of this 40 gallon polyethylene receptacle is a versatile, effective solution to enhance sites. This large capacity receptacle is the perfect balance of style and durability that helps keep properties attractive and professional. The sleek aluminum pitch in top adds character to the modern feel, while encouraging proper waste disposal. Constructed from impact, weather resistant, 100% recycled polyethylene, this unit will not stain, rust, dent, chip or fade from day to day conditions and high volume day use. This receptacle exceeded when tested in long term weatherability (UV8) and environmental stress and crack resistance (ESCR), making this unit ideal for both indoor and outdoor spaces.